Where Do Armadillos Come From and Can Armadillos Swim? 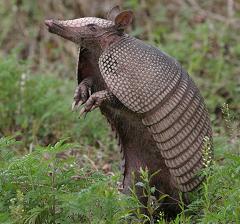 Armadillos are small placental mammals that have leathery armored shells. There are about 20 extant species of armadillo, and there are native to the Americas, where they live in many types of environments. Armadillos can swim, despite what has been commonly reported elsewhere. The bony plates that protect an armadillo weigh it down, but it can still maintain buoyancy for short distances by gulping air to inflate its intestines. That said, it often prefers to cross small waterways by simply crawling along underwater. Armadillos love to dig, and many species use their sharp claws to dig for food, and to dig dens. Can Sheep Swim, How Do They Learn How To Swim, and Which Other Mammals Can Swim? Can rattlesnakes swim and can snakes swim underwater? What Do Armadillos Eat and What Does Armadillo Poop Look Like?